The dental office of Clive Rosenbusch, DDS is proud to offer Fotona’s Smoothlase laser facial rejuvenation out of our state-of-the-art office in Boca Raton, FL. Smoothlase is a revolutionary, non-surgical, non-invasive procedure that uses fractionalized laser and the body’s own natural healing process to lift, tone, and tighten loose skin around the mouth, chin and lips. It smooths light to medium wrinkling and improves skin tone by bringing back elasticity, giving you a more youthful feel and appearance. After you turn back the clock, maintaining the results through diet, lifestyle, and occasional touch-ups prevents future wrinkles and loss of skin tone and elasticity. Smoothlase uses the safe, time-tested energy of laser to stimulate the deep structural support layers of the skin—including those typically addressed in a surgical facelift—without disturbing the surface of the skin, all done from inside the mouth. The effect of focused laser energy on the growth of new collagen over time. 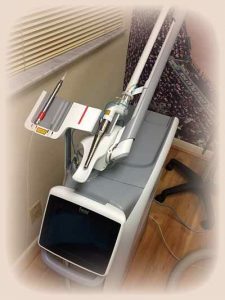 The Fotona Lightwalker ASP Powered Laser is used to tighten up the face from inside the mouth. The advantage of this is that it is all done naturally by heating up the collagen and stimulating the fibroblasts that make collagen, to tighten up existing collagen and make new collagen. The procedure takes about an hour and is done at 21 days intervals, anywhere from 5-10 visits, depending on the severity. There are no after effects except for a slight warm feeling in a few cases. The procedure costs $700 per visit. The advantage is that there is no sign that anything has been done and the patient can immediately return to their normal daily routine. Also, there are no foreign substances injected into the patient every 3-4 months like botox and other fillers which can cause sagging of the face if they are eventually stopped. The Fotona Lightwalker Laser used, is the most up to date and most powerful laser on the market. It has the advantage of having 2 lasers in one by having 2 different wavelenthts. The changes are very subtle and are only really noticed after the 7-8 visit. Severe cases may need more than 10 visits. This procedure avoids surgery and fillers but can be used in combination with them so that the natural tightening is done first and then these procedures are done afterwards. One of the procedures used afterwards, which is showing great success is injecting the patients own body fat after it has been treated, into areas of the face in combination with PRP (platelet rich plasma, derived from centrifuged blood from patient) or PRF (platelet rich fibrin). We work with a couple of highly trained and experienced plastic surgeons in Boca Raton, if these additional procedures are needed. If you would like to schedule a free consultation, or have additional questions about the SmoothLase procedure, please contact us our at (561) 394-7888.